Amazon.com trumps other online retailers' sales by HOW much?! It should come as no surprise that Amazon.com is the galactic leader in online retail sales, but what may be surprising is exactly how epic its lead is. The US Securities and Exchange Commission recently wrote to "about a dozen" online retailers, The Wall Street Journal reports, asking for "hard details" about the amount of stuff they sell through their websites. "The agency is concerned that retailers are hyping their Web prowess by claiming high percentage growth rates while failing to disclose how much that growth affects total sales," the WSJ says. "Percentage growth", of course, is a tried and true dodge to disguise real sales-increase numbers. After all, if you have a market share of 0.5 per cent, and you grow that to 1 per cent, you can claim a 100 per cent growth rate. Which figure would you prefer to trumpet to your investors, an actual market share growth of 0.5 per cent, or a growth rate of 100 per cent? Target, for example, recently told investors that its online sales growth has been in the double-digits, the WSJ reports, but when asked by the SEC for actual numbers, the company said that "digital sales represented an immaterial amount of total sales." According to trade-news website Internet Retailer, Target might as well throw in the towel if its goal is to even remotely challenge Amazon's hegemony. 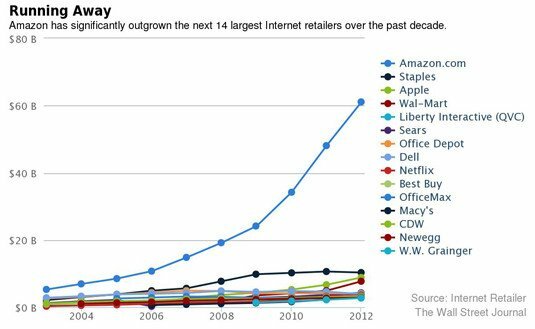 According to that publication's figures, Amazon sells more online than its 12 top competitors combined. Not only is Amazon crushingly far ahead, but its online take is growing while the sales of other online retailers slips. Office-supply giants Staples and Office Depot, for example, are experiencing online-sales slumps, as is Dell. Even companies that are experiencing high-percentage growth rates – Apple and Wal-Mart, for example – remain more than $50bn behind Amazon's juggernaut. 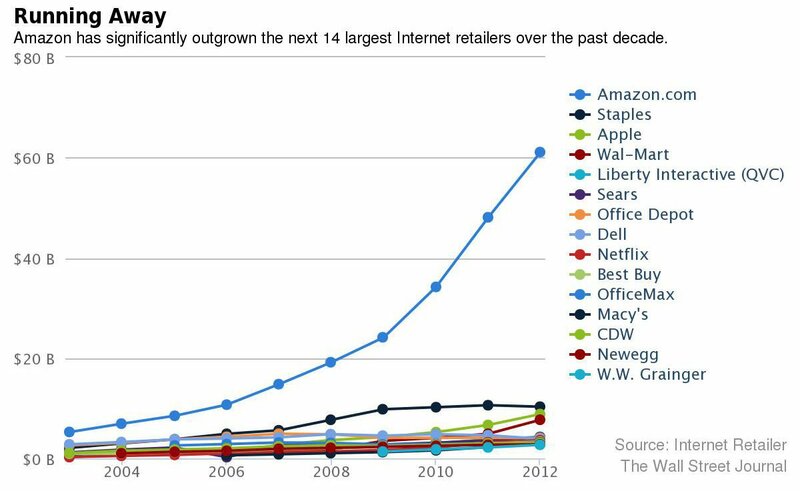 On the whole, online sales remain a small part of the US retail economy, but they are growing – if slowly. According to the US Commerce Department, such sales totaled 5.8 per cent of all US retail sales in the second quarter of this year, an increase of 0.7 per cent from the same quarter last year.